Government Primary School in Morthikri village has perhaps the best teacher-taught ratio — one teacher for one student. But despite the one-on-one interaction, the teacher is frequently miffed with her student. She hit her with a slate on Friday and caused bleeding injuries to the class V student. The girl has not gone back to school after the assault. The Government School in Dera Bassi tehsil of Patiala district, about 20 km from here, has the basic infrastructure that most rural schools lack — a pucca building, chairs and tables and blackboards. What it lacks is students. Narenderjit Kaur was the only student. The school teacher, Ms Santosh Kumari, told The Tribune that though she had enrolled 13 students in the school, only one girl student of class V was attending classes from the beginning of the current academic session. The rest, the teacher said are children of migrant labourers and slum dwellers and were on a month’s leave due to the harvesting season. She also said that the children of slum dwellers and migrant labourers were not regular. Most of them did not even have the money to buy books. The villagers said that the school had enrolled three students (one in class I, IV and V) last week. But they did not attend classes. They claimed that the teacher had shown ‘fake’ enrolments in order to keep the school going. Moreover, the only student — Narenderjit Kaur of class V — while talking to The Tribune alleged that her teacher assaulted her with a slate (made of hard cardboard) following which she sustained injuries on her head. ‘’ The teacher washed my head and did not permit me to return home. I was allowed to go home after the school was closed,” she claimed. Ms Santosh Kumari, however, clarified that the girl had sustained injuries at home. The scar of an old wound was accidentally scratched when she was mildly slapped for committing a mistake, she maintained. Complaining against the villagers, Ms Santosh Kumari said that some of them had thrice misbehaved with her in the past. She said that they often herded their animals into the school’s premises for grazing. Even the windows have been damaged by the villagers, she alleged. Mr Harpal Singh, a former sarpanch of the village, alleged that the teacher did attend to her job seriously and they had to admit their children in government and private schools in Daffarpur and Ramgarh villages. Moreover, such was the level of teaching that the students who were studying or had passed out from Government Primary School, Morthikri, were unable even to write their own names. Arena Multimedia has launched its comprehensive and compact two-and-a-half year career course, Multimedia Specialist Programme 2004, which incorporates the latest industry relevant technologies and is designed in five semesters, including modules on Graphics, Authoring Multimedia, 3D Animation, Multimedia for Web and Games and Portfolio Management. Students have the option of completing the course in 18 months if they choose the fast track option. The new look Arena Multimedia Specialist Programme — 2004 curriculum integrates multimedia for web and gaming and utilises the latest globally acclaimed software and multimedia technologies. Power-packed software, includes Illustrator CS, Photoshop CS with Imageready, Pagemaker 7.0, Corel Draw 11.0, Quark Express, in the Graphics Suite, Sound Forge 6.0, Adobe Premiere 6.5, Director MX 2004, Author ware 6.5 in the Authoring Multimedia suite, 3D Studio Max 5.0, Character Studio 3.0, Elastic Reality 4.0, Adobe After Effects 6.0 in the Animation Suite, while the Multimedia for Web and Games includes Flash MX 2004, Dreamweaver MX 2004, A5. The graphics module delves into the ‘Basic of Art’, where students learn to create digital graphics images. Besides, it enables them in Visualisation of imagery, creating digital graphics, editing and optimising of graphics for the web, print and publishing, including digital printing, and broadcast media. On completion of the authoring multimedia module, the student will be well versed in storyboard writing, develop streaming audio, record and edit audio files, create video content and produce streaming video for the web, enrich video content by applying effects and prepare it for post-production job, develop CBT’s, CD-Rom’s and put them on the web. The animation suite teaches 3D animation and will enable students to develop broadcast quality animation, morphing and warping of still graphics. Multimedia for web and games has been so designed to allow students to prepare content rich and interactive websites with animation, host and maintain web sites, and design and develop games. Finally, in the digital portfolio development module the student learns the process of multimedia development life cycle, including project scheduling, resource allocation, quality processes and maintenance of the projects developed. 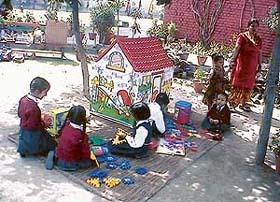 Children play on the school premises. Founded as a kindergarten in 1973, Saint Soldier International School, Sector 28-B, Chandigarh, is a manifestation of the vision of its founder-chairman S.G.S. Hayer. Driven by the philosophy of Guru Gobind Singh “Sarbat ka Bhala”, the school aims at imbibing in its students the virtue of universal brotherhood by learning to know, learning to do, learning to live together and learning to be. It is a progressive school affiliated to the Central Board of Secondary Education, New Delhi. Nestled amidst the most salubrious surroundings, Saint Soldier International School has always endeavoured to create for its pupils an environment which is conducive to the spirit of healthy competition in all spheres of educational activities, leading to the development of a fully integrated personality. The school is a coeducational, residential one, admitting a heterogeneous group of students hailing from diverse social economic backgrounds, receiving education together with the purpose of all-round development. Saint Soldier International School, raised by its founder with an eye on perfection, has well-planned multi-storeyed buildings, spacious and lush playgrounds, well-equipped books and CD library, computer and science laboratories and well-ventilated and large classrooms, all of which provide a sought-after ambience for the students to bloom and groom into enlightened citizens of the 21st century. Academics is based on making learning easy through projects, audio-visual aids, hands-on practical experiences, exhaustive assignments and worksheets and periodical assessment, culminating into continuous evaluation of every student. The school imparts physical education to all students as part of the academic schedule. In the various games offered, the student may choose any two and avail himself or herself of all opportunities provided in the school to become an expert in them. Value and spiritual education is done through morning assembly. 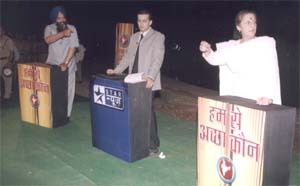 Students of each house of Shaheed Bhagat Singh, Mother Teresa, Rabindranath Tagore and Dr Radhakrishnan participate in presenting thoughts, news, songs, articles and topics. Each class is given an opportunity for mass participation on special celebrations marking national and festival days of traditional significance. The school achieves its objectives through highly motivated and dedicated teachers with their commitment to the learner, the parent, the school and society. Constant efforts to shape average students into high achievers with innovative talents, by exploring and harnessing their latent traits through multifarious curricular and co-curricular activities are always in the process and monitored at appropriate levels. Exchange programmes of teachers and students, orientation of staff and participation in inter-school activities have enriched and honed up the talents of the school. Under the leadership of and with the efforts of Principal S. Choudhary, administrator Col J.S. Narang (retd) and director S. Jaswinder Singh, the process of improvisation continues and the school has wider horizons for the future. A wing for medical and non-medical streams at senior secondary level with emphasis on scientific ambience has been started. The school rests on the four building blocks of education — knowledge, wisdom, spiritual perception and universal values. Swami Vivekanand once said, ‘Education is not the amount of information that is put into your brain and runs riot there undigested, all your life. We must have list building, man making, character making assimilation of ideas. If you have assimilated five ideas and made them your life and character, you have more education than any man who has got by heart a whole library’. There are few subjects so controversial as education. Everyone has his or her own ideas about it, but most people believe that they have got some special key to the truth. I believe that education is the harmonious development of the faculties of man. It does not consist of learning of rudiments of certain subjects in order to qualify at some examination, but in developing an attitude of mind, in which learning becomes a habit, a second nature. Education is the continuous enlightenment of the mind. Unless different things learnt become absorbed and merged into a living conception of life and knowledge, education forfeits its purpose. The school is committed to providing choice and flexibility which allows a student to make a programme of study tailored to his or her own interest and need. From a modest beginning, the school has come a long way and today, by all standards, is an entity to reckon with. The school’s structure reflects its strong belief in the development of an intellectual, aesthetic and social growth of each student at each level. With this guiding philosophy, the school has embarked on a meaningful and purposeful journey into the third millennium, with a number of immediate future projects on the anvil, that, to mention a few, include complete automation of all areas, be it school finance, administration and academics, medical and non-medical wings at the senior secondary level, school auditorium and, above all, a vast programme on green schooling. The project itself is going to include multifarious activities such as organic gardening, conservation of energy and water, rain water harvesting, waste recycling and many other such environment-friendly activities. The best results can be evoked only by foresight and preplanning. No event, howsoever small, is achieved overnight. Strifes and struggles, energy and effort pave the way to every eventful creation, this is the unique feature of our school and a quality we endeavour to instil in our students. Be it academics, sports or cultural activities, students burn the midnight oil, persevering and pursuing their goal. The school, of course, is the target, always. The Punjab and Haryana High Court today asked the Companies Law Board to decide all issues concerning the Chandigarh Club, Chandigarh, within two months. Disposing of an appeal filed by Chandigarh Club Limited, the Bench also gave liberty to all parties to approach the Company Law Board with their grievances and complaints. These issues include the objection by some members that the previous managements knowingly inducted more members so as to take the strength of members beyond the sanctioned strength of 5,000 as well as the declaration of the result of the elections. In its appeal against the order of the board, Principal Branch, New Delhi, the club had claimed that as per the Companies Act the Broad of Director has the power to register and increase the number of members. Thus, it said there was no illegality in the increase in number of the members. Member Rajeev Kwatra had filed a petition in the Company Law Board, New Delhi, challenging the increase in the number of members beyond 5000. He had also sought directions to not allow the extra members cast their votes in the recently-held elections. The High Court had ordered that the result of the elections would not be declared till final orders. An independent candidate for the forthcoming Parliamentary elections from Chandigarh, Mr Arvind Jain, has moved the High Court challenging the action of the Chandigarh Estate Office in removing banners and other publicity material from inside shops of his supporters. In his petition, Mr Jain, who is a contestant for the Chandigarh Lok Sabha seat, has claimed that the action of the Estate Office was illegal as his supporters had every right to display banners and posters showing their support for him. He has said that the Estate Office should not have removed any banners and posters unless a complaint in this regard was made by the shopkeeper concerned. After hearing his counsel, a Division Bench comprising Mr Justice Swatanter Kumar and Mr Justice Rajive Bhalla issued notice of motion to the UT Administration. The case will now come up on May 6. Nestled in the lap of nature...no, we are not talking of a hill station with its pristine surroundings, but the house of ace shooter Raja Sidhu, which exhibits his love for the wild and beautiful. Be it the sprawling greens in the front and the back, antique paintings of wild birds or hunting equipment like daggers on the walls, the house is every bit an expression of the owner’s love for the wild. “Since hunting is banned by the government, my passion for wild animals and birds is now restricted to the confines of my home,” he says. The house is built on a three-and-a-half-kanal plot in Sector 9, Chandigarh. An imposing structure with a cream façade and arches, it is difficult to imagine that the house was once a hostel for girls. “It had 21 rooms and 18 bathrooms when we bought the house. We had to virtually rebuild it to have its present shape,” says the lady of the house, Ms Gugu Sidhu. And a Herculean task it must have been for sure. In its present avatar the house has two bedrooms, a living room, a “den” and a kitchen on the ground floor and four bedrooms on the first floor. The Sidhus say they had initially hired an architect for the layout plan, but they changed it at the time of construction. The house is simple in structure and has no fancy interiors. But the beauty of the house is in the display of the collection of antiques and artefacts from all over the world and the memorabilia presented to Raja Sidhu during his hunting trips to Scotland, or while he was visiting the US, Japan or Pakistan. The elements of space, air and light have been taken care of while designing the house. Huge bay windows in all rooms ensure light and air and all rooms are large (the bedrooms are 25 x 20 feet in size). The living room has been done in neutral and earth colours. A painting depicting a hunting scene with the hunter’s catch of birds dominates the wall. Crystal, exquisite green glass jars from Pakistan, an antique painting of Ptarmigans and, of course, the numerous awards and trophies won by Raja Sidhu are displayed in the living room. The monotony of the huge room is broken by having two sitting arrangements. 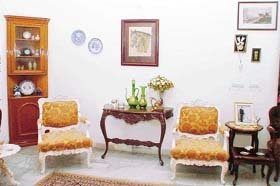 The family den, done up in pink and gold, is also adorned with the shooter’s awards and trophies, besides Oriental dolls and other artefacts. But it is the small doorway leading into the house that captures your attention. Done in green, with consoles and mirrors to reflect light, it exhibits Mrs Sidhu’s love for all that’s green. The master bedroom has wardrobes running all along one wall and a small sitting arrangement. Antique beds are painted white, and look refreshing. This is not for the first time that city-based artist Devender Singh has courted fame. His paintings on Sikh Gurus have adorned museums all over the globe, but to create a replica of the Golden Temple for prestigious Smith Honiam Museum in Washington DC, it is a dream come true for him “I have never visited the museum myself but to know that my creation will now adorn one of the finest museums in the world, gives me a sense of worthiness as an artist,” says Devender, with a clear note of pride as he exhibits the model of Golden Temple displayed in his studio in Sector 38. Ready to be shipped to the Smith Honiam Museum in a week’s time, the replica is made of pure silver and gold. “I have studied each part of the Golden Temple and made a film on it so that I could capture the true essence of the temple,” he says. The main temple is placed on a 4 feet by 4 feet painted glass framed with wooden planks that creates an illusion of the ‘sarovar’. The offer came unexpected. “Mr Mohan Singh who was the curator of the Government Museum and Art Gallery here was the connecting link between the Washington museum and me and because of his support and encouragement, I took up the project,” says Devender. A few Sikh organisations based in Washington are also helping him financially to execute this project which has cost him about Rs 5 lakh. Devender, who started his career as an illustrator for popular Amar Chitra Katha publications shifted his focus to spiritual themes after he was commissioned to make a calendar based on Guru Arjan Dev’s poetry on 12 months by Punjab and Sind Bank way back in 1972. With Sobha Singh as his source of inspiration, Devender has been doing just that. Using bright vibrant colours and realistic figures, the artist has brought many aspect of Sikh history alive. “A painting must speak for itself,” says Devender. Same goes for his three dimensional models. Devender is already planning a bigger size of the same model for a private collector in Norway. As the General Elections progresses and political debates reach a crescendo, “Hum Se Achha Kaun” on Star News takes the action to the masses. The show brings leading politicians from various constituencies face-to-face with their electorate for a live, uncensored and often heated debate. Reliance Infocomm, with the cooperation of AIIMS, CBSE, ICSE and state school boards, will post examination results on R World, the Java-based suite of data applications of Reliance IndiaMobile. Over 70 results, including those of class X, class XII and engineering and medical entrance tests, will be posted on R World over the next three months. Students and their parents would be able to view exam results instantly and anywhere on their Reliance IndiaMobile (RIM) phones. Results will be published on the mobile application “Exam Results” in the R World suite of applications as soon as the boards or universities announce the results. “The application launched last year with the CBSE, ICSE, and the Uttar Pradesh state board received tremendous response, spurring us to expand the service across the country. The application has been enhanced to look up results for multiple roll numbers in one go. The service recently went live for the Haryana state-level VIII standard exams. R World Exam Results over the next 90 days will benefit over 30 million students,” said Mr Mahesh Prasad, president, Application and Solutions Group, Reliance Infocomm. On R World, the user can select the Exam Results application from the main menu. RIM subscribers can also access the results using Reliance Infocomm’s 1234 SMS-based service. Unlike in R World, customers using this service have to enter the appropriate “keyword” for a particular exam, which can be obtained by sending an SMS message with the keyword “Exam Help” to 1234. The user can send an SMS message by typing different keywords for different exams followed by the roll number and send it to 1234. A return message will give the result summary. Park Avenue has come out with its latest offering, Fine Tech shirts, which are made from 100 per cent cotton yarn, spun especially to keep the summer heat at bay. While patterns have always been in style in some shape or other, stripes are all the rage this season. Stripes also serve as an optical illusion; vertical stripes can serve to give you the added height one might be looking for. Fine Tech collection boasts of bold fashionable stripes in vibrant colours. Apart from stripes there are other designs that include solids, checks, fil-a-fil and twill chambray that are sure to entice the man in you.